Published in the UK today by Simon & Schuster, the first two titles in a brand new action series for younger readers. Battle Champions by Jack Carson (a pen name for my writing partnership with the author, Michelle Misra) has been great fun to create, and comes packed with illustrations by the very talented Damien Jones. 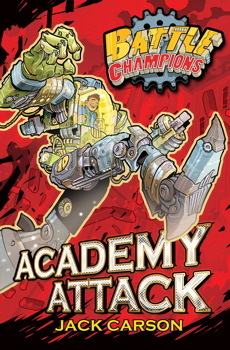 There are four paperback titles in the series so far, kicking off with Academy Attack and Canyon Clash. Coming soon... Swampland Slam and Terminal Takedown. Battle Champions is available in paperback, ebook and audio download. Sometime in the future, a war destroys the world as we know it. As people struggle to rebuild their lives, a new sport emerges from the ruins. 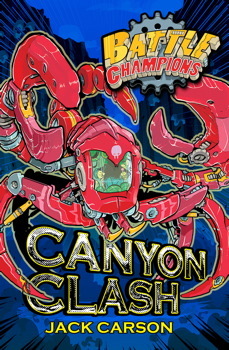 In the Battle Championship, giant robots known as ‘mechs’ square up to one another and fight like gladiators. They’re controlled from the inside by talented pilots, in a fight that tests man and machine to the limit. All kids grow up dreaming of piloting a mech, and Titch Darwin is no exception. But for Titch it’s personal. He is the son of one of the greatest Battle Champions – a man who went missing on the Championship trail – and the only way for Titch to find out what happened is to follow in his father’s footsteps . . .